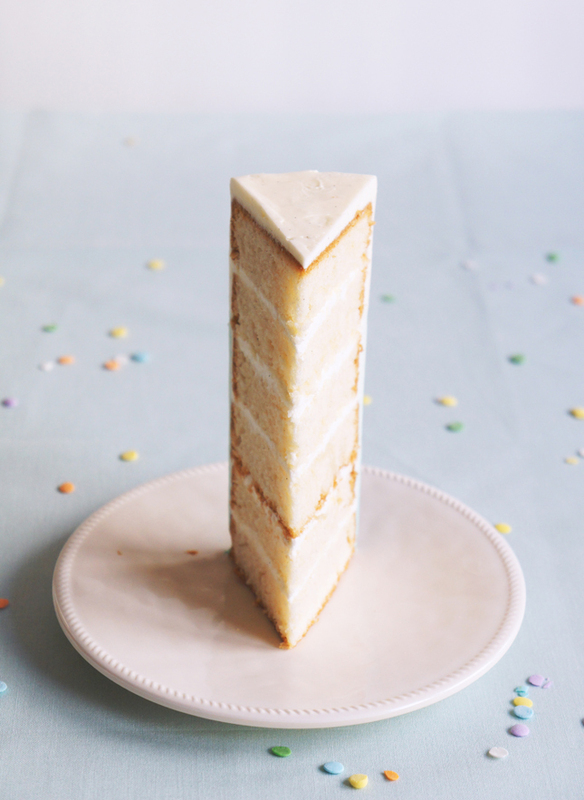 This pretty 6-Layer Vanilla Bean Birthday Cake is a real vanilla bean bomb! Loaded with 3 whole vanilla beans. Yep, that’s right. And that is what makes it so great, pure natural vanilla flavor through and through. I used my favorite white cake recipe (it’s easy, tastes amazing and works great every time) in combination with a classic Swiss meringue buttercream, both packed with vanilla seeds. The end result is the prettiest and most scrumptious vanilla bean birthday cake! The ombre frosting is actually really easy, even if you’ve never done it before. All you need is 3 different colors of buttercream… well, more on that you can read in the recipe. I’ve been wanting to make a tutorial on how to make these cute bear toppers but instead I strongly recommend this tutorial by Cake Journal. It’s free, easy to understand and the teddy bear is just the cutest one ever. Give it a try! Preheat oven to 350°F / 180°C and butter and flour three 6 inch cake pans (or 8 inch cake pans). In a medium bowl, whisk together the egg whites and milk. In a separate bowl, combine the flour and baking powder. In the bowl of your electric mixer fitted with the paddle attachment, cream the butter, sugar, and seeds of the vanilla beans on medium to high speed until light and fluffy, for about 3 minutes. Let the cakes cool down on a cooling rack completely. In a small saucepan over medium heat, bring sugar and ½ cup water to a boil. Boil until syrup reaches soft-ball stage (240°F on a candy thermometer). With mixer running, pour syrup down side of bowl into egg whites in a steady stream. Beat on high speed for about 15 minutes until the egg whites are cool to the touch and stiff and glossy. Beat in butter a few pieces at a time. Add vanilla bean seeds and beat until smooth. If it looks curdled at any point, keep beating to smooth out. To make the ombre effect, take out about a third of your frosting and add 1 drop of food color. Divide the colored frosting in half, set one half aside, and add a few more drops to the remaining frosting to achieve 2 different colors. Cut the tops of your cooled cakes and slice them in 6 layers. Save the cake tops! You can use them to make these super delicious Vanilla Bean Cake Truffles with Toasted Pistachios and White Chocolate. Now frost your cake, starting with the white buttercream on top and ending with the darkest color on the bottom. If you want to find out more on how to frost your cake, read a detailed tutorial. Such a pretty cake, I love the idea of using 3 vanilla beans! Must give it a go. Wow! What a professional looking cake! Thank you for sharing the links to the recipes and tutorials. Who’s birthday is it? Simply adorable….and looks absolutely delicious! This is one of the most beautiful cakes I have ever seen. Well done! I just came across your website and all of your cakes look amazing. Thanks for sharing! I would love to make this cake, but I can’t seem to find the actual recipe, just seeing the pics. Can you guide me to the recipe? Thanks! Hi Crystal, the recipe is over at Best Friends For Frosting, here you go! Hi Melina, I adore this cake completely! All of your work is stunning! Thank you for sharing your recipes with us, I noticed on the Buttercream recipe there is no amount listed for sugar, how much sugar is needed for this Buttercream? Thank you so much in advance!!! My sons birthday is tommorow. I’m trying to make the buttercream now and I see it doesn’t say how much sugar. Now I’m stuck. Hi, there is not amount listed for sugar on the Buttercream recipe? Can you let me know how much sugar is needed for this Buttercream? Hi Melina, I’ve just found your website and your cakes look gorgeous! I’m in Australia and was wondering how many grams are in a stick of butter? (our butter doesn’t come in sticks here 🙂 ). Also, the link to the ombre frosting tutorial doesn’t seem to work anymore?